Definition: The analogue instrument is defined as the instrument whose output is the continuous function of time, and they have a constant relation to the input. The physicals quantity like voltage, current, power and energy are measured through the analogue instruments. Most of the analogue instrument use pointer or dial for indicating the magnitude of the measured quantity. The classification of the analogue quantity depends on the number of physical quantity they measures. For example, the instrument uses for measuring the current is known as the ammeter and the voltmeter is used for measuring the voltages. The wattmeter and the frequency meter measures the power and frequency respectively. The analogue instrument is classified by the type of current that can be measured. The following are the types of an electrical instrument. Both Direct and Alternating current Instruments. Recording Instrument – Such type of instruments gives a continuous reading over a specified period. The variations in quantities are recorded on the sheet of papers. 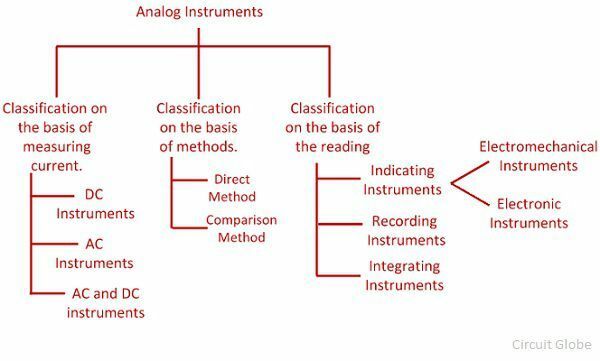 Integrating Instruments – The instrument which measures the summation of the electrical quantity over a given period is known as the integrating instruments. The classification of the analogue instruments can also be done by the methods used by the instruments for comparing the measured quantity. The following are the classifications of the instrument by the methods. 1. Direct measuring Instruments – The instruments directly converts the measurand into energy which activates the instruments and the value of the unknown quantities measured through it. Ammeter, Voltmeter, Wattmeter and the energy meter are the examples of the direct measuring instruments. 2. Comparison Instruments – The comparison instruments measure the unknown quantity by comparing it with the standard value. The example of the comparison instruments is the ac and dc bridges. Their accuracy may also classify the analogue instruments. The analogue instruments can be categorised according to the principle of operation. The following are the effect uses the analogue instrument for their operation. Magnetic effect means the current flows through the conductor induces the magnetic field around it. For example, consider the conductor is converted into the coil. 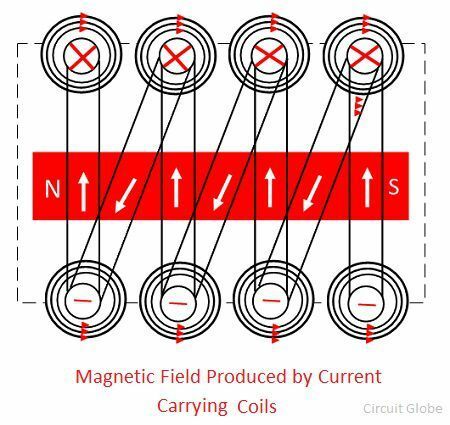 The summation of the magnetic field of the coils will behave as an imaginary magnet. The measurand current passes through the heating elements increases their temperature. The thermocouple attached to the element converts the temperature into an emf. The conversion of current into an emf with the help of temperature is known as the thermal effect. 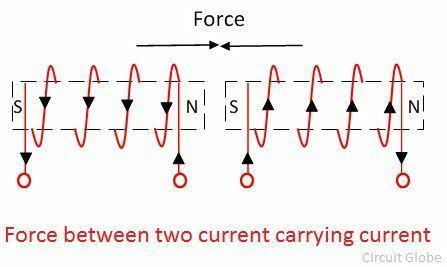 The electrostatic force exerted between the two charged plates. This force is used for displacing one of the plates. The instruments which work on this principle is known as the electrostatic devices. The non-magnetic conducting disc placed in a magnetic field induces an electromotive force. This magnetic field is induced by the electromagnet which is excited by the alternating current. The electromotive force induces the electric current insides the drums. The interaction produced by the induced current and the emf moves the disc. This effect is mostly used in the induction effects. The material produces an electric current in the presence of a transverse magnetic field. The voltage is produced between the two edges of conductors. The magnitude of voltages depends on the current, flux density and property of the conductor.